My awful headache and pain in the neck kept me again from sleeping all night. And my "adam's apple" still persists being bad. My swallowing seems funny, and that peculiar little pain on the right of my throat (as if a taut tendon) bothers me. 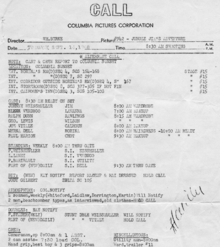 My headache and bad throat-swallowing was greatly overlooked when a heart-warming call came from Columbia Studio. 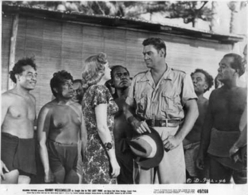 It was a role -- "but only $55," Marvin Schmall explained apologetically -- in a Jules White comedy! Jules White! I almost couldn't believe it. 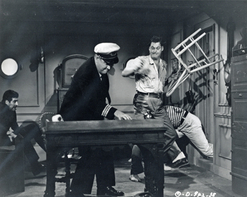 He hasn't called me for a job since he witnessed the breaking of my nose with a vase in the Billie Burke comedy last January 9. 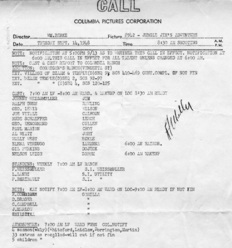 Went to Columbia Studio where I was given a Vera Vague comedy script, stopped for a diathermy treatment at the hospital, visited Jules White, ordered some still-photographs from Publicity and merrily rode on home. Another pleasant call came. 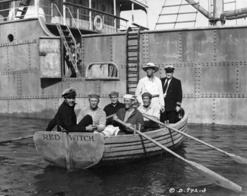 From Ray Corrigan of Corrigan's Ranch (World Famous Movie Shooting Ranch of mountains, lakes, etc). Ray invited me to "not only visit, but work in a picture" next Monday. And "at my daily rate," he said. This he got because I confessed to him what Columbia last paid me. This morning I anxiously awaited for over two hours without hearing from Leo Brown, until much too late. Virginia Brooks came at my request & drove me out to Columbia Ranch -- where I already had missed the Corrigan bus. Then I had her drive me way out to Corrigan's Ranch in a suspenseful hope that I still had not somehow lost the job. I didn't. Ray dressed me in a real Gorilla outfit, to play it "legitimately." Imagine! 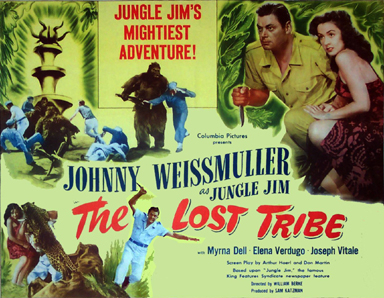 I met Johnny Weissmuller, Nelson Leigh, & others in this "Jungle Jim" picture by Sam Katzman. 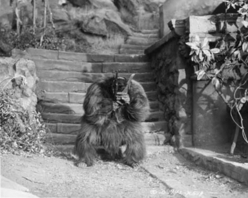 It was fun to be a "gorilla" and "walk around on all fours" for a change. An exciting day of shooting! 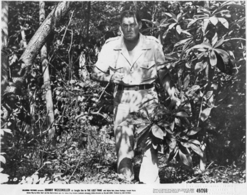 The check for my acting the "gorilla" role in Sam Katzman's movie "Jungle Jim" was even bigger than we expected -- and so I finally bought that pair of trousers I've needed for so long. 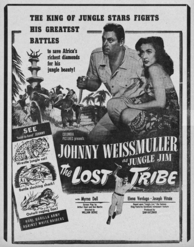 Second in the "Jungle Jim" film series , THE LOST TRIBE stars Johnny Weissmuller, famous star of the "Tarzan" movies produced in the 1930s and 1940s. 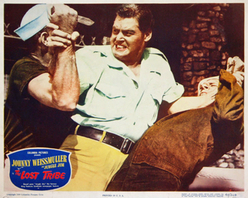 A renowned Olympic swimming gold medalist in the late 1920s, after a decade and a half as "the Ape Man," Weissmuller changed his character's name, kept his shirt on, and made sixteen more jungle-action films. 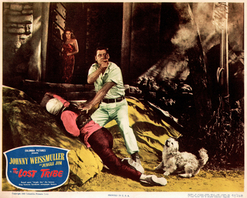 As mentioned in his diary, Emil met fellow actor Nelson Leigh while working on this film. 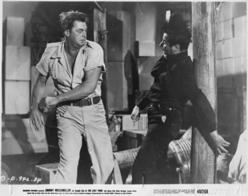 Leigh was a relatively unknown character actor (much like Emil) who played small roles and bit parts in scores of movies, including THIEF OF DAMASCUS (1952) with Lon Chaney Jr. and Stooge foil Philip Van Zandt, REBEL WITHOUT A CAUSE (1955) with James Dean, GUNFIGHT AT THE O.K. 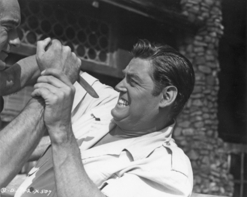 CORRAL (1957) with Burt Lancaster and Kirk Douglas, and OCEAN'S ELEVEN (1960) starring Frank Sinatra and the Rat Pack. 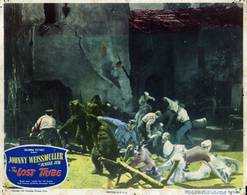 Produced by Sam Katzman and directed by William Berke, THE LOST TRIBE has "Jungle Jim" fighting both wild beasts and greedy plunderers to save a lost African city. 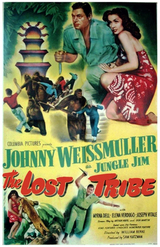 Despite being lightly regarded by critics, the "Jungle Jim" movies were very popular in their day and spawned a television series in 1958 that also starred Weissmuller. 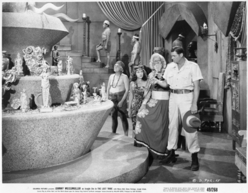 As a child I watched "Jungle Jim" movies on TV and found them enjoyable and entertaining. 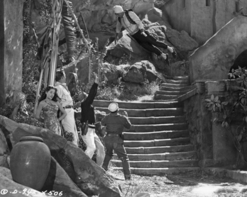 Hey, a handsome hero fighting bad guys and ferocious animals while rescuing an attractive woman -- what's not to like? 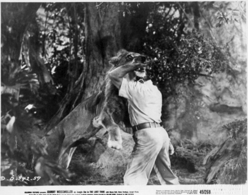 But I'll never watch another one again without thinking about the actors inside those gorilla costumes.